The seaside of the Mediterranean is seen here in this seascape tapestry "Cliff Dwellings". This region of Europe is full of charm and beauty from its gorgeous countryside as well as the buildings on the coastline. 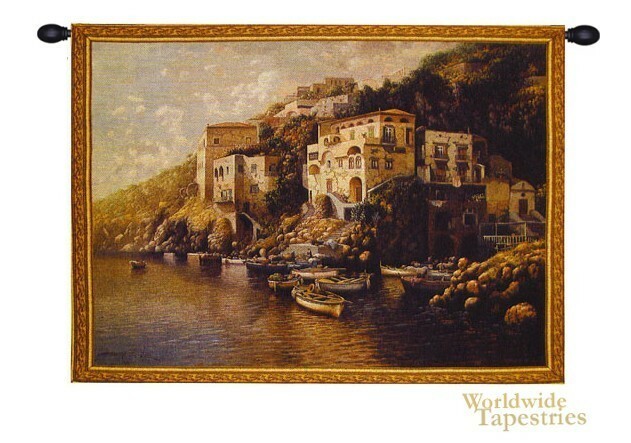 Here in this tapestry we see boats moored on the village where the villas are built into the rocky cliffside of the edge of the sea. The landscape itself is dotted with shrubs and represents the fertile region of the Mediterranean. This seascape tapestry "Cliff Dwellings" is unlined, and has a tunnel for easy hanging.